Don't you find it hard editing your own blog? Sometimes I seem to have dyslexia. No I read fine. It’s just that sometimes (well, okay, frequently) I invert the typing of the word I want to put down. Sometimes, the spacing is also erroneous. I am typionf now eithout correxcutn the missed words. Let's see. The quick bronw fox jumped over the laxe dit. Again. Peter peere pipcled a pecj of picleke pepper. LOL. I do onot have dyslexia \! I just odnlt know have the ability to type! Back in high school, we were not taught how to type. I know that there were schools offering tying as an elective subject. 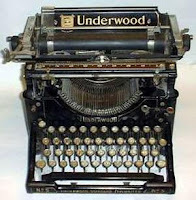 I learned to type by pounding on the trusty Underwood typewriter we owned. That typewriter was so heavy, I cannot lift it alone. It's so heavy that if you choose to throw it (if you can) at someone, that someone will surely die or be in a coma. To learn the proper way of typing, you have to hover your hands over the second row of keys (A S D F J K L ;). Then you type The quick brown fox jumped over the lazy dog. Why these sentence? Note that all the letters of the alphabet are included in the sentence. My cousin said, I have to hit the letter T,Y,G,H,F,J with my first finger (pointer): the letters R, E, U, I, D,K with the second finger ( naughty =D): the thumb is used for the scroll bar : the third finger is for the letters W,P,S,K and so on. I do not know about you, but I have never felt comfortable with the finger placement. Maybe that's the reason why I can't type well. Anyway by the time I was doing my undergraduate thesis, I was high tech! My papa bought me a portable Olivetti typewriter. It was light, small and requires no pounding to type. If my Underwood was my desktop, the Olivetti was my laptop. I did not commit many mistakes when I was using a typewriter. I cannot bloody afford a mistake! There was just no way to correct a mistake until that chalky-strip-paper was invented. To use the chalky strip, you have to dangle it on the letter you want to correct, type over the letter you want corrected and walla! You can retype the letter now for the mistake has been covered with chalk. Then came the correction fluid. This is easier to use for you only have to "paint" over the mistake with the white liquid, fan it to dry then retype. My three eldest girls learned to type when they were in grade school. Their school had a computer class called WordStar. It sounded pretty funny to me then because I was thinking parallel to Star Wars. My girls type fast. With my youngest daughter and son, typing dexterity came naturally. They were born in the age of computer. I still think I was a better typist than my kids. Why? They do not have to be careful with their typing. They can afford to type fast and with blatant disregard to typing rules. Why? Because for every mistake that they commit in typing, hitting the delete or backspace bar will make everything all right. Not liek me and typists of my gneneraion. We habe to be real carful or our typping will dsuffer. i remember my highschool days when everyone are dying to have a typewriter... good day! This is a refresginly witty blog, and I've done excatly as you said tyoing without hitting the back buttn, and it sure hecj is hard.! I've linked you up. Hope to hget t read more of your posts in time. Regardless of your current typing ability, it is possible to more than DOUBLE your effective typing speed and reduce the number of mistakes that you make (and the time/keystrokes needed to correct them). You can do this by learning typing shorthand. Think of ‘tv’ (2 characters) for example. We all know that the full English word for that is ‘television’ (10 characters). Now anyone who would read ‘tv’ would automatically know that what is being referred to is in fact ‘television’. How about we look at an abbreviation that may be less widely recognized like ‘IBM’ for example? That abbreviation actually stands for ‘International Business Machines’ (in case you didn't know). A three (3) character abbreviation (IBM) is used to replace thirty-three (33) characters. That’s a 92% savings. With shorthand typing, it’s possible to uniquely identify words and phrases that we all type on a regular basis and develop shorthand abbreviations for them. Then we can type the abbreviations and have a software program automatically replace the abbreviations with the expanded words/phrases that they represent. Correctly spelled and capitalized. This will save a significant number of keystrokes and time. I would like to invite you to check out my website (www.typeless.biz) and see how it’s possible to actually do LESS typing and to produce more output in less time. Also, you can lessen the likelihood of ever developing Carpal Tunnel Syndrome which can put ALL of you typing out of commission for a long time.